According to French newspaper Le Figaro, Israel has already put its tiny F-35 Lightning II fleet to use as early as mid-January of this year, having only taken full delivery of the first F-35s in their 75-strong order in mid-December of last year. Reporter Georges Malbrunot, Le Figaro‘s Middle East correspondent, the F-35’s supposed initial foray into combat occurred in the late night/early morning hours of January 12-13 in an airstrike on Mezzeh Military Airport, Syria, where facilities housing surface-to-air missiles destined for use with Hezbollah, an Islamist terror organization based in Lebanon. Mezzeh, located just outside of Damascus, has been the frequent target of Israeli strikes over the past four months. Claims cross between Israel using both aircraft and surface-to-surface missiles to attack the site,and the Israeli government has admitted to carrying out occasional strikes in Syria to deny the transfer of weaponry to Lebanon, where Hezbollah would likely attempt to use said arms to attack Israel, as it has done in the past. In January, Israel only had just two F-35Is in their possession. These F-35s have been based at Nevatim Airbase with the Israeli Air Force’s 140 Squadron. 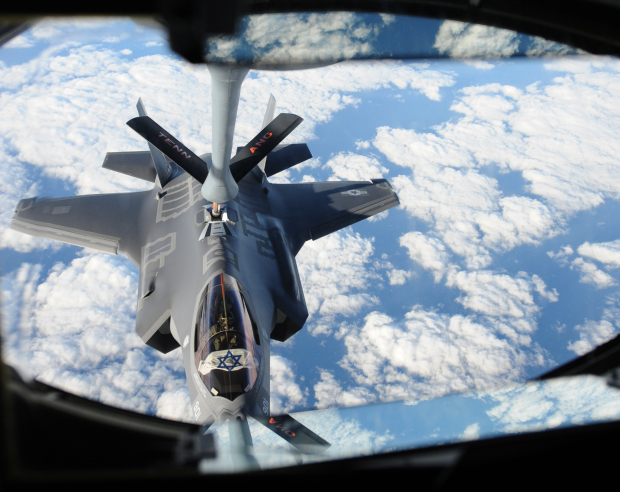 Ever since the IAF received their first F-35Is, known as “Adirs” (Hebrew for “awesome” or “mighty one”), they’ve been flying and training in tandem with F-16I Fighting Falcons. If the F-35I did actually carry out its first combat mission, which is still very difficult to believe, it would be the second fifth-generation fighter to make its combat debut over Syria, after the F-22 Raptor in late 2014. The F-22 also participated in air-to-ground strikes, carried out at nighttime. US Air Force officials touted the Raptor’s stealthiness and radar-evading technologies as being the primary reason behind the advanced multirole air superiority fighter’s deployment to the skies over Syria. Conversely, “combat testing” isn’t actually unheard of at all. In fact, the US Air Force did just that with the General Dynamics F-111A Aardvark between March and November, 1968, when it deployed six F-111As to Southeast Asia as part of the Combat Lancer test plan.